We have the power to have complete dominion over them, but instead of using that power to cause pain we should be using it to create the most respectful and nurturing relationship between us that we possibly can. Animal liberation because if we don’t do it, who will end their suffering? They have not had a voice for far too long, and we are closer than we ever have been to changing the unquestioned norm that animals are ours to use as property. Becoming an activist for animals was something I immediately wanted to do the moment I learned what was being done to animals all around me every day. Something within me had lit on fire, and it became all I could think about every day. My activism didn't start until a year after becoming vegan because I didn’t know another vegan or activist, and I didn't have the confidence or knowledge on how to start my own protests or activist group. I will always remember my first DxE disruption with Keira Devine in Philadelphia. I was petrified, confused, and yet absolutely inspired. I knew then that there was a place for me in the movement and that I could be doing so much more for animals in my everyday life. I became an organizer of the Harrisburg chapter immediately after I got home from the 2015 National Animal Rights Conference. I was so inspired after meeting Priya, Wayne, and so many others from DxE, and knew that I could make a huge impact in my own town. Since then, I have finally found my voice for animals. I cannot explain the way DxE has helped me grow as a person and as an activist. It has given me a constant sense of urgency. My thoughts on activism now is that not doing anything just isn't an option. They need our voice now more than ever and we have to always keep that focus. My favorite moment in activism was definitely disrupting Tom Wolf at the Farm Show Complex in my hometown of Harrisburg, Pennsylvania (PA). It was amazing to see new activists there who were very nervous but got out there and showed such bravery and strength. Most of the activists who came traveled hours to get here for it early in the morning. That day, the animals had a voice that had not yet been heard in Harrisburg, Pennsylvania. It's such a small, rural city where a very large majority of the population is hunters and farmers. I wanted to show other activists in small towns that it IS possible. That these high-impact disruptions don't just happen in big cities with fifty activists. My hope was to inspire those with small numbers that they can do this, too. That even just a small group of passionate people can get together and make a big impact for animals. We are all capable of so much more than we think we are. Q: How did you manage to organize and pull off the Farm Show disruption, and what advice would you give to activists attempting a large scale disruption such as this? 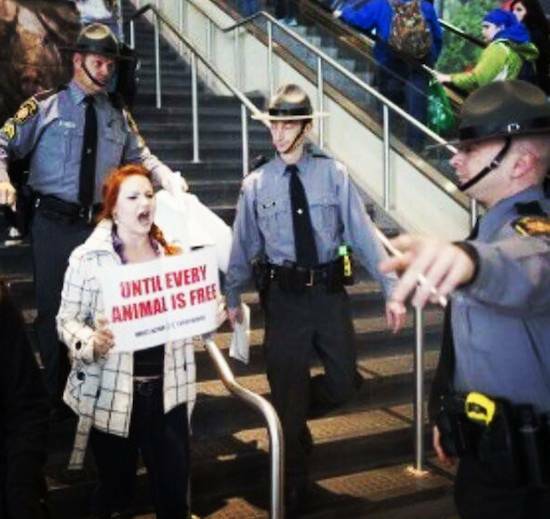 Activist Rachel Ziegler, surrounded by police, demonstrates powerfully at the Pennsylvania Farm Show. Disrupting this year’s PA Farm Show was something I started thinking about more seriously after an attempt to disrupt another large event with Zach Groff and some others. I wasn’t totally confident in how it would actually play out, but doing a large-scale disruption seemed far more attainable after being a part of (an attempted) one first-hand. Originally, my plan was to just disrupt the vendors in the building, but after a lot of trolling and asking around on Facebook and calling the Farm Show and talking to their staff, it was confirmed that PA Gov. Tom Wolf would in fact be there giving a speech. From there, it sparked a fire among local activists, and before I knew it, I had a dozen people lined up for the event. Olivia (from my chapter) and I went into the building the night before and checked out the large arena where the speech was to be held, only to find that the Governor would be speaking in the stands and not on the ground. So much for the plan to hop the fence! I took plenty of pictures, asked the security guards a lot of questions, and mapped out where we would all sit in the stands. When we walked in on the day of, we realized we could just sneak under the rope and sit in the VIP section. A lot of it was just luck that there were empty seats at the top of both sets of stairs that gave us a direct pathway to the balcony ten feet below us. We had basically boxed in the Governor. Chris, Amine, and Matt were all below us and parallel to the balcony. We were all communicating through a group chat. Chris and I coordinated the timing - we agreed that he would start by coming out from the side and I would follow from up top, leading the rest down the stairs. From there it was pretty simple! I never would have imagined how successful it would be. My advice to others wanting to do a large-scale disruption would be that it is not nearly as scary or as difficult as you think it is. I would also say that the most important part is communicating with everyone involved, making sure everyone is clear on what the plan is, spending a lot of time focusing on details of the event, and being overly prepared. Don’t be afraid to call the place beforehand and ask a lot of questions to make sure everything will line up right. Be careful, but also don’t be afraid of getting creative, using your acting skills, and taking risks (like jumping onto a stage or sneaking into a VIP section). Know that some things will be unpredictable, and you may have to just go with it. Try to have back-up plans! You have to think like an infiltrator [laughs]. Also, make sure you have someone who is VERY tech-savvy and can handle all the press releases and the media. Zach Groff and Tiffany Walker were an incredible help with this! Q: What keeps you motivated in your activism? What keeps me motivated is the never-ending reminders all around me that animals are suffering immensely at the hands of humans every second of every day. Speciesism is everywhere. It absolutely crushes me inside, but it also keeps me fighting harder for them. I am at a point where activism is just a part of my everyday life, whether it’s a disruption of a restaurant or a silent disruption in someone’s thoughts as they read the back of my car window. It’s what needs to be done whether I feel like it or not. As Will Potter says “Wake up and fight.” So every day, I wake up, and I fight for them. It’s what I would want if I were the one trapped inside those walls. My advice would be that it gets easier each time. Whether you’re organizing an event, getting yelled at by your audience, or dealing with the emotional drain of it all, it becomes more normal and expected. What used to hurt and cause a lot of tears is now just a part of the process that I hardly acknowledge. Everyone is different of course, and there may always be a feeling of nervousness or discomfort. It’s helpful to have at least one or two other activist friends who you can confide in and get support from. I would also advise keeping the big picture in mind and not getting discouraged when you don’t see immediate results. Social justice movements are not won overnight, and we do have quite a journey in front of us. However, I think that with each disruption of speciesism, with each leaflet, with each news story, and with each conversation, we get that much closer to animal liberation. Because no one in the world is more deserving and more completely defenseless than nonhuman animals, whose fate is literally in the hands of humans. We have the power to have complete dominion over them, but instead of using that power to cause pain we should be using it to create the most respectful and nurturing relationship between us that we possibly can.